A friend works in a plant biology research lab. 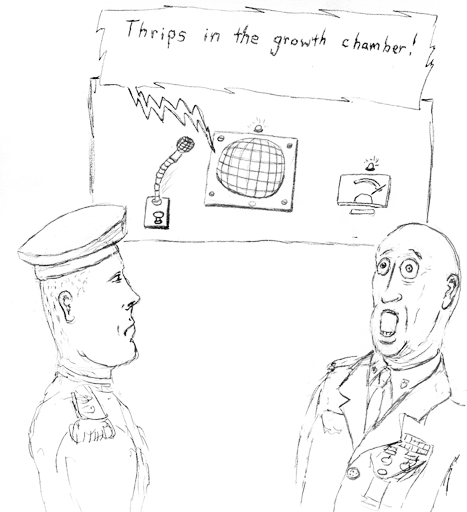 Last week she uttered the phrase "thrips in the growth chamber" and others seemed to empathize with the magnitude of the consequences that implies. For me, it sounds like a hell of a catch phrase. It conjures up a number of images. This is the first one. I kind of imagine this as the one intelligible phrase that can be heard over the static on an intercom at some isolated base. OK, I watched The Thing a few weeks ago, so maybe that ties in. But I imagine the two officers on duty would have different reactions; for one it's shock and fear, for the other it's a stoic acknowledgement of the situation and all that it implies. Fun fact of the day: thrips is both singular and plural!